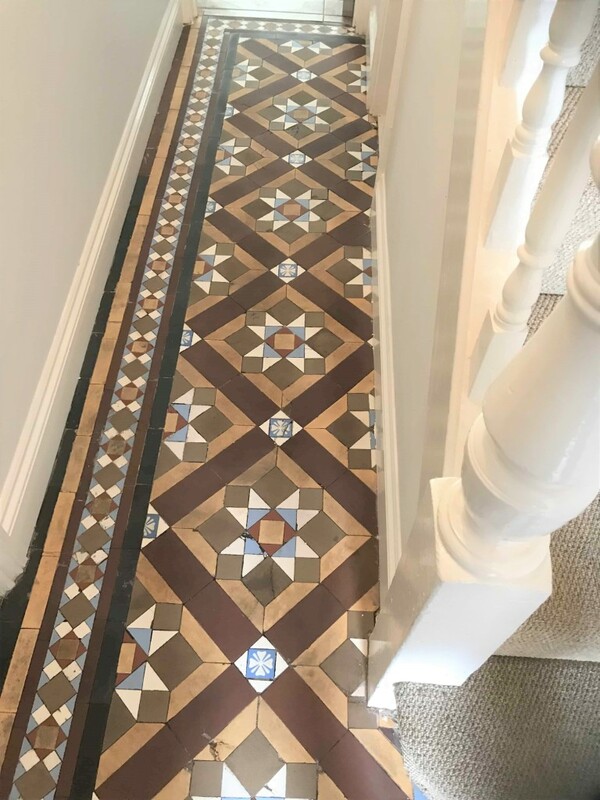 This is a great example of a classic Victorian Tiled Hallway and shows just how hard wearing and durable these floors are. The floor had been installed at a house in Swansea what must have been well over a hundred years ago and was now very badly soiled however I knew from experience that with the right techniques and products they can be given a new lease of life. We mainly use diamond burnishing pads on original Victorian tiles these days, the alternative is to use cleaning products however that method tends to use a lot of water and can aggravate an issue known as efflorescence whereby salts from the sub floor are carried up through the tile as moisture evaporates leaving white salt stains on the surface of the floor. This is not a problem with modern floors as they are usually have a damp proof membrane installed under the floor which prevents damp. 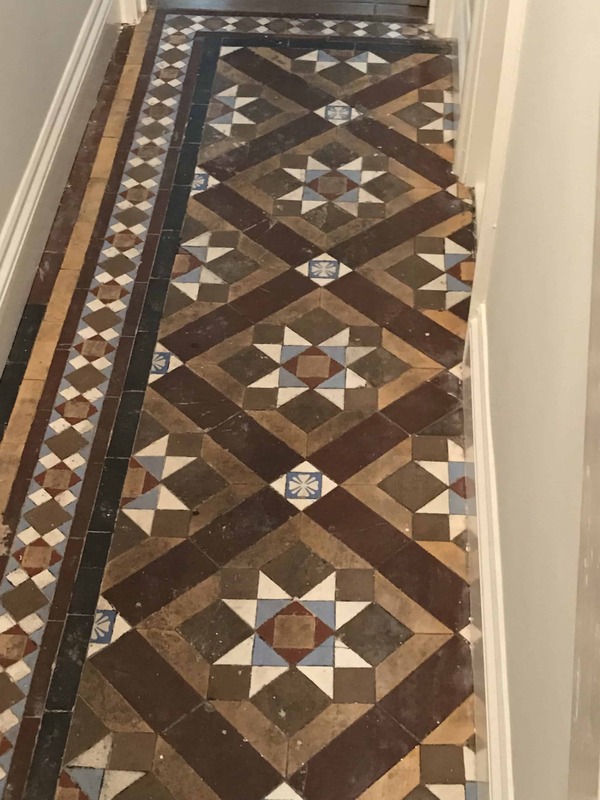 To restore the appearance of the Victorian tiles I started with the application of a coarse 200-Grit diamond encrusted burnishing pad which cuts through the dirt and removes surface staining. The pad is run over the tiles using water to lubricate and then the floor rinsed afterwards to remove the soil that is generated. The soil is then extracted off the floor with a wet vacuum. This is then followed up with a 400-Grit pad which cleans and restores the surface which is left roughened after the application of the coarse 200-grit pad, again the pad is applied with water and then the flor rinsed afterwards to remove the soiling and the water is extracted using a wet vacuum. The next step was to give the floor an acid wash using Tile Doctor Acid Gel, the acid neutralises the alkaline mineral salts in the floor and reduces the chance of efflorescence occurring, After being scrubbed into the floor the gel is rinsed off the floor using water which is then quickly extracted with the wet vacuum. The floor was left to dry off overnight and I came back the next day to apply the sealer. Before starting the sealing process it’s important to check the floor is dry first for which I use a hand-help damp tester. I find it’s a good idea to take readings from various parts of the floor before I start a job so I can establish a normal background level for the floor. All was well so the floor was sealed using a couple of coats of Tile Doctor Colour Grow which is an impregnating sealer that works by occupying the pores in the clay tile thus preventing dirt from becoming ingrained there. This particular sealer also enhances the natural colours in the tile and is fully breathable which is important in these situations where you need moisture to evaporate through the tile and not become trapped underneath where it could work its way into the walls of the house. It’s worth knowing that if you do experience effluence salts which are more likely in the damp winter weather, then they can be mopped off the floor before they harden without any damage to the sealer itself.